The term originates from the practice of covering a letter by folding a separate sheet about it to physically protect it and prevent infringement of confidentiality. In the first half of the 19th century it became the fashion to cut the cover into a diamond or lozenge shape. This was the precursor of the version of the envelope known today. Its convenience and popularity led to the lozenge design being adopted for the special pre-paid postage envelopes and covers issued in 1840 after postal reforms were introduced by Rowland Hill and others. A philatelic cover is an envelope or post card prepared with a stamp(s) and address and sent through the mail delivery system for the purpose of creating a collectible item. There are several different basic categories for covers. Names for cover types is also terminology usually used by collectors of stamps and postal history. There exist a wide variety of covers that can fit into several basic categories. The categories begin with the most common types of collectible covers, such as first day covers or first flight covers. Sometimes there will be an area of overlap in the subject of categories. For example, there are First day covers that were also sent with mail aboard airplanes on First flight mail runs. Event covers can also include, First flights, or other types of covers. A military cover sent to a head of state can also be referred to as a Historic cover. A first day cover is typically an envelope with a postage stamp canceled on its first day of issue. The design or theme of the stamp may be printed on the cover to enhance its appeal to the philatelic community. An event cover celebrates an event or notes an anniversary. Stamp on cover. 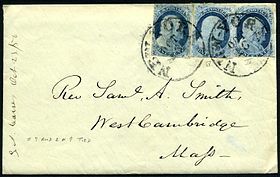 This is a cover that is collected as an example of a given stamp postally used on a cover, however older stamps with recent cancellations are usually philatelic (mailed with the intention of recovering and collecting the item). A pre-stamped cover is a cover that already has an imprinted stamp. First flight covers are those carried on an aircraft, usually authorized by a government or postal administration, for the first time on a particular route. A stampless cover is an envelope or folded outer sheet bearing an address and manuscript or ink-stamped postal markings without prepaid adhesive postage stamps, normally from the period before adhesive postage stamps became available or common in the mid-to-late 19th Century. Military covers can include a wide variety of subjects that may include first flight covers, and prisoner of war covers. Mail sent from an Army Post Office (APO) or a Navy Post Office (Fleet Post Office, FPO) are common types of military covers. Railroad covers is mail that was processed aboard special rail cars outfitted with an official post office where mail is processed en route to its general destination. Historical covers are those that have special historical significance above and beyond that of the average collectible cover. These can include mail sent by Kings, Presidents or other heads of state. If the historical cover is i.e. to or from a General in an Army the cover then can also be classified as a military cover. Names for cover categories are usually used as general reference in philately. If aspects of a cover (date+postmark, name+address) are referenced in a historical capacity the category of the cover may not even be mentioned. Other specialty types of covers include Censored covers along with Blockade mail, Pony Express covers, Prisoner of war covers and Patriotic covers, among others. The availability of the different types of covers varies considerably and is something that often adds perspective to the historical and philatelic significance of the cover. For example, First Day covers and First Flight covers are generally common because the events that inspired the creation of these covers were somewhat common. In other examples, various types of military and historical covers are often scarce or rare because the circumstances or events that prompted the creation of these covers were conversely uncommon. While covers sent in recent decades tend to be common, they can also prove to be scarce simply because the circumstance that created these covers were (sometimes very) uncommon, as are the various examples of historical covers i.e. sent by a head of state to another officially prominent individual. At the same time there exist covers that are quite old but are still common and not very difficult to find, as are various types of post cards or commercial covers. Patriot covers are generally common because the practice of sending these was popular, especially during periods of war. Patriotic cover availability here can vary also depending on the country and time period in question. Covers collected for the stamp on cover can vary greatly in availability and generally depends on the availability of the stamp issue itself along with the demand for the use of a particular denomination. The denomination of a stamp often determines the availability of the issue on cover as the use of some, usually higher, denominations was uncommon because of the low demand for a particular postage rate. There are a number of circumstances that can affect the availability of a given cover type and which often contribute to a cover's historical and philatelic value. ^ "Covers in Phalately". Smithsonian National Postal Museum. Retrieved 11 December 2010. ^ "Collecting Stamps: Covers". OldAndSold Philatelic. Retrieved 10 December 2010. ^ "Stamps, History". The Wright Library. Retrieved 10 December 2010. ^ a b c Rick Miller. "Cover collecting 101: basic terminology and definitions used by collectors". Linn's Stamp News. Retrieved 26 January 2016. ^ "A Short Course on First Day Covers". American First Day Cover Society. Retrieved 10 December 2010. ^ "Site Map". USPCS. Retrieved 1 February 2019. ^ "USPS Military Mail APO FPO". stamps.com. Retrieved 1 February 2019. ^ Kloetzel, James (17 August 2010). "Patriotic Covers". Arago. Smithsonian National Postal Museum. Retrieved 1 February 2019. ^ Frajola, Richard (March 2002). "The Myerson Collection". www.rfrajola.com. Retrieved 1 February 2019. Wikimedia Commons has media related to Covers. This page was last edited on 14 March 2019, at 00:00 (UTC).